Album: What Time Is It? What Time Is It? is the second full-length studio album by The Time, and was released in August 1982, 13 months after their first album The Time. Like the previous album, What Time Is It? was largely written, recorded and produced by Prince, and contained no input from band members other than Morris Day, although all band members were credited. 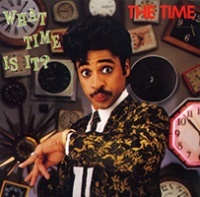 Four of the six songs were credited as written by The Time and two by Morris Day, but Prince wrote all six songs (with lyrics on Wild And Loose written by Dez Dickerson). The album was recorded in two sets of sessions. Gigolos Get Lonely Too, The Walk and Wild And Loose were recorded in mid-January 1982. 777-9311, Onedayi'mgonnabesomebody and I Don't Wanna Leave You were recorded in May or June 1982. All tracks on the album feature only Morris Day and Prince, apart from spoken vocals by Vanity on The Walk. Other tracks recorded for possible inclusion on the album included Jerk Out (later released by The Time on Pandemonium), International Lover (released by Prince on 1999), Bold Generation and Colleen. The album produced three singles, 777-9311 (which preceded the album), The Walk, and Gigolos Get Lonely Too and The Time supported the album by touring as one of Prince's opening acts on the 1999 Tour. The album reached number 26 on the US Billboard Pop Chart and number 2 on the US Billboard Soul LP's Chart. The vinyl long play is the original issue. The Time toured extensively as one of two opening acts on Prince's 1999 Tour, beginning in November 1982 (along with Vanity 6, for whom The Time played musical backing). This page was last modified on 24 November 2017, at 13:49.